Chateau Trotte Vieille is one of the oldest properties in St. Emilion. In fact, documents are clearly able to date the formation of the property all the way back to 1453! While some estates in Saint Emilion were around at that time, most were not producing wine. That is not the case here. There are ancient manuscripts that make mention of the vineyards and that wine was already being produced by Trotte Vieille in 1453. Trotte Vieille is an interesting name. As it did not come from a previous owner, or the commune where the vines are planted, what is the origin? While we cannot be sure, the legend that is repeated today states; there was an elderly lady back in the 14th century who was quite the busybody. She delighted in knowing everything about everyone in her village. She would walk over to where the stagecoaches stopped after departing from Bordeaux and she’d rush to the coaches to learn of some news. This act caused the residents of Saint Emilion to name her, “old trot”, or in modern times, Trottevieille. Jumping into the modern era for Chateau Trotte Vieille, in 1949, Marcel Borie, one of the principals of the well-known, Bordeaux negociant, Borie-Manoux, gave the Saint Emilion vineyard to his son in law, Emile Casteja. 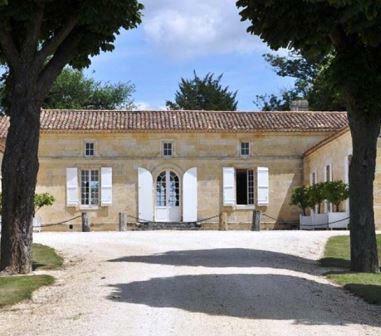 The Casteja family own several vineyards in Bordeaux including Chateau Lynch-Moussas and Chateau Batailley in Pauillac and Domaine-de-LEglise in Pomerol. Philippe Casteja remains in charge of Chateau Trotte Vieille. The 13.5 hectare vineyard of Chateau Trotte Vieille is planted to 55% Merlot, 40% Cabernet Franc and 5% Cabernet Sauvignon. The vineyard is in 1 single block, which is not common. Chateau Trotte Vieille has a terroir of clay and limestone soils. Located just east of the village, the vineyards are not far from Troplong Mondot or Pavie Macquin. The vine density is 7,500 vines per hectare. The vineyard has old vines that are on average, close to 50 years old. However, the estate has some very old vines. One parcel has vines that are more than 100 years old! Some of the vines are even pre-phylloxera, making them among the oldest vines in the Right Bank! Most of their oldest vines are planted to Cabernet Franc. Chateau Trotte Vieille maintains some of the oldest vines for producing Bordeaux wine in the right bank. In fact, several of these old vines are pre-phylloxera. That means some of their vines are over 150 years old! The former 10 hectare vineyard of Chateau Trotte Vieille gained an additional 3.5 hectares of vines when following the results of the 2012 St. Emilion Classification. Their other St. Emilion estate, Chateau Bergat was merged into Chateau Trotte Vieille giving them a total of 13.5 hectares of vines in Saint Emilion. In fact, starting with the 2004 vintage, Chateau Trotte Vieille began producing a small amount of wine made from their oldest vines. This unique 100% old vine, Cabernet Franc wine, “Les Vieilles Vignes du Chateau Trotte Vieille” is not commercially available as it’s produced in such small amounts. 135 hand etched bottles are produced each vintage, making this the rarest wine made in Bordeaux today. The wine is aged in 100% new, French oak barrels. Chateau Trotte Vieille previously employed two consultants, Gilles Pauquet and Denis Dubourdieu. However, that recently changed. The estate now uses the advice of Thomas Duclos. To produce the wine of Chateau Trotte Vieille, vinification takes place in traditional, concrete vats. The wines are aged in an average of 98% new, French oak barrels for between 12 and 18 months. The chateau produces about 2,500 cases of Bordeaux wine per year. There is a second wine, La Vieille Dame de Trotte Vieille, which made its debut with the 2000 vintage. 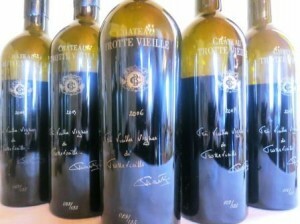 Chateau Trotte Vieille is much better with at least 7-9 years of aging in good vintages. Young vintages can be decanted for 1-2 hours, or more. This allows the wine to soften and open its perfume. Older vintages might need very little decanting, just enough to remove the sediment. Chateau Trotte Vieille offers its best drinking and should reach peak maturity between 8-25 years of age after the vintage. Chateau Trotte Vieille is best served at 15.5 degrees Celsius, 60 degrees Fahrenheit. The cool, almost cellar temperature gives the wine more freshness and lift. Chateau Trotte Vieille is best served with all types of classic meat dishes, veal, pork, beef, lamb, duck, game, roast chicken, roasted, braised and grilled dishes and hearty fish courses like tuna, pasta, risotto and cheese. Elegant, soft, fresh and refined, there is an energy to the medium/full bodied layers of black cherries that stands out. Made from a blend of 56% Cabernet Franc, 43% Merlot and 1% Cabernet Sauvignon, the wine offers a distinctive note of flowers, red berries, espresso and forest notes. The slightly higher percentage of Cabernet Franc in the blend is due to the damage from the frost. Fresh, sweet round fruits, licorice, juicy black cherries and silky polished tannins, this is the blend that works extremely well for Trotte Vielle. The wine was produced from 53% Cabernet Franc, 45% Merlot and 2% Cabernet Sauvignon, reaching 13.5% alcohol. The harvest began October 6, finishing October 21. Another wine that is better from bottle than the barrel, the wine has richness, chocolate covered red fruits, licorice, and espresso. The texture is soft, polished and caressing, the fruit has ripeness, elegance and flesh. There is length in the sweet, fruity finish. This is the best vintage of Trotte Vieille I have ever tasted! Licorice, sweet cherries, flowers and bitter chocolate open the nose. On the palate, this wine is plush, polished and fruity with freshness and character. The wine was produced from a blend of 49% Merlot, 49% Cabernet Franc and 2% Cabernet Sauvignon. The harvest took place from September 28 to October 9. The is aged in 100% new, French oak barrels. If this puts on a bit more weight during the aging process, it could easily merit a higher score. Medium-bodied, soft, red and dark fruits, flowers, and earthy notes on the nose. The wine is soft, forward and delicate, making it a candidate for early drinking. Medium bodied, with a combination of leafy forest scents, flowers and plums, with a hint of tobacco and earth, the wine is on the elegant, refined, classic side, finishing with bright, red, earthy fruits. Medium bodied, elegant soft and silky, the plums and cherries are ripe, fresh and sweet. A few more years of aging will add even more secondary characteristics to the truffle, spice and floral notes already found here. Dominated by Cabernet Franc at 58%, the rest of the is Merlot. This medium bodied, plum and black raspberry filled wine offers a spicy, floral personality that is probably more interesting on the nose than on the finesse styled palate. The wine reached 14% alcohol and was the product over very low yields which added to the wines concentration and texture. The floral nose is packed with earth, spice, smoke, licorice and blackberry. Rich, deep, concentrated and fresh, there is a nice sense of purity to the fruit. The wine was produced from a blend of 60% Cabernet Franc and 40% Merlot. Medium bodied, with a spicy, floral, red berry personality, this scarce wine is soft, polished and filled with sweet cherries, earth and stone. Blending 50% Merlot, 47% Cabernet Franc and 3% Cabernet Sauvignon produced a medium bodied, sharp, fresh wine which focuses on red berries and herbs ending with bright, sweet and tart fruits in the finish. Spicy, floral, leaf, herb, and raspberry notes open to a soft, fresh, tart, wine finishing with a bright, fresh, wild strawberry sensations. Mature in the nose and the color, the wine is light and drinking at peak. The spicy red berries are already starting to fade. Flowers, earth, smoky tobacco and fresh berry notes open to a mineral driven wine with a lot of stone in the bright, fresh, red berry finish. Light ruby in color, dominated by Cabernet Franc, the wine has tobacco, earth, herbs and red berries that make up its personality. Medium bodied and already showing well, the finish is marred by a dry sensation in the ending. Medium bodied, with soft textures and a complex perfume set off by notes of licorice, earth, black cherries, plum and truffle notes, there is a nice sensation of mineral and herbs before you get to the soft, plum and cherry filled finish. Filled with scents of licorice, plums, coffee, cocoa, spice and black raspberries, this soft textured, lush, sweet, St. Emilion ends with a long, fresh, supple, blackberry and spicy, red plum finish. A few more years will add a lot to this wine. Herbs, fresh raspberries, stone, forest and mineral notes create the nose. Medium/full bodied with spicy, red berries and earth in the mouth, this is a fascinating wine to taste as it was produced using 100% Cabernet Franc from pre phylloxera vines . Showing maturity in the color, the wine offers earth, spice, forest and black cherry scents. Medium bodied and ready to drink, this easy to like, round wine should be enjoyed sooner than later to preserve its fruit. The debut vintage of this unique old vine project from Chateau Trotte Vieille pops with fresh herbs flowers, licorice and plum. Medium bodied, soft, sweet and mineral driven, this was a lot of fun to taste as it was produced from 100% old vine Cabernet Franc. Light, soft and lacking a depth of fruit, this red fruit and jam dominated wine requires drinking. Fully mature, simple, easy to like black cherry, earth stone filled wine that should be drunk up sooner than later. Fully mature, medium bodied wine that focuses more on its earthy, floral, cherry and mocha inspired perfume, than on the lighter, palate presence, capped by the earthy, red berry notes in the soft textured finish.